COLUMBUS — Recital series Sunday at Central will host a concert with virtuoso violinist and Columbus native Christian Howes on Sunday, October 17 from 7:00 to 9:00 p.m. at Central Presbyterian Church. This one-of-a-kind evening will feature Christian on violin, Hamilton Hardin on keys, Cedric Easton on drums, and Josh Hill on guitar. In addition to performing music from Christian’s new blues concept album Out of the Blue, the quartet will perform classical works by Antonio Vivaldi and Johann Sebastian Bach treated with modern improvisational arrangements. The event is part of a weeklong series of Columbus events in support of Out of the Blue. Tickets cost $15 for adults and $5 for students and can be purchased at the door. Central Presbyterian Church is located at 132 South Third Street in downtown Columbus. An Associate Professor at the Berklee College of Music, Christian Howes is widely regarded as one of the world’s premiere jazz violinists. Having worked with such wide ranging artists as Les Paul, Bill Evans, Greg Osby, Spyro Gyra, and Dafnis Prieto, his classical training and wide range as an improviser prepares him to meet the needs of producers in a wide array of genres from classical, jazz, hip hop, pop, and world music. The 2009 Downbeat Critics Poll ranked Christian second in “Rising Stars/Violin,” which was his sixth time being ranked in the poll. 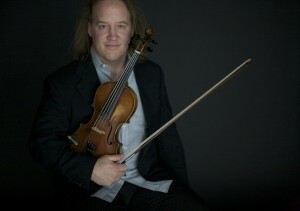 The Minneapolis Tribune credited Howes with being “arguably the most intriguing young violinist in Jazz.” All About Jazz said that “As a jazz violinist, [Christian] has no peer.” Christian lives in New York and tours with his own ensembles as well as co-led projects throughout the United States, Europe, and Asia. Visit www.christianhowes.com for more information. Sunday at Central is a nonprofit chamber music recital series that was founded in 1994. It offers intimate, personalized traditional chamber music concerts featuring Columbus-based professional musicians. The series’ Artistic Director is Columbus Symphony Orchestra Assistant Concertmaster David Niwa. Sunday at Central presents seven concerts a year on Sunday evenings. For more information, visit sundayatcentral.org.